Register Now for the 3rd GLOBAL BUSINESS CONFERENCE in Koronadal City! The Green Valley College Foundation, Inc. together with the Association of Training Institutions for Foreign Trade in Asia and the Pacific (ATIFTAP) will conduct the 3rd Global Business Conference this coming September 26, 2011 at The Farm in Carpenter Hill, City of Koronadal. 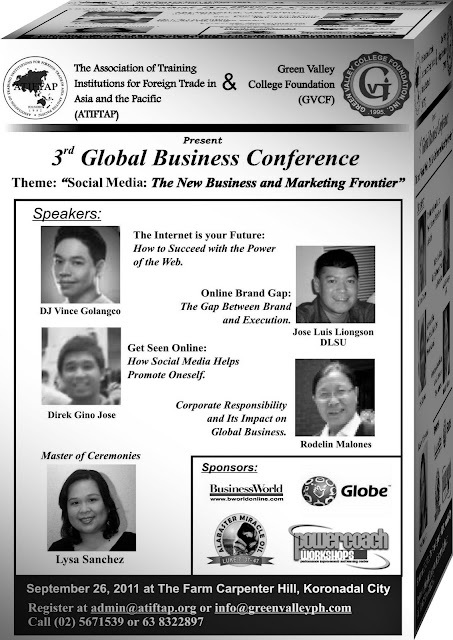 “Social Media: The New Business and Marketing Frontier" is the theme of the 3rd Global Business Conference. It aims to discuss the language of Social Media and identify best practices that will help aspiring and existing entrepreneurs become successful in export markets. Get the chance to listen and learn from notable speakers which includes DJ Vince Golangco, a celebrity blogger. He will talk about how to succeed with the power of the web. Mr. JL Liongson, the Chair of the Marketing Department of De La Salle University will discuss the online brand gap and Director Gino Jose, MTV Director and celebrity will speak on how social media helps promote oneself. Surely, the day will be filled with interesting and practical facts, tips and ideas which would escalate our knowledge on social media and how it would help in terms of marketing. For registration, call (083) 228-4034 and look for Ms. Jesiah Arabaca or visit The Admission Center at Green Valley College located at General Santos Drive, City of Koronadal.